The Scarborough Bowls Centre was built on the site of the former Floral Hall Theatre and opened in 1989 when it was named the Alexandra Bowls Centre. 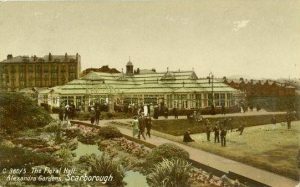 The Centre’s name came from Princess Alexandra, who opened a number of tourist attractions in Scarborough at the turn of the century including the nearby Peasholm Park. The Centre was managed by Scarborough Borough Council but by 2001 the future of indoor bowling in the area looked bleak, especially when a change in the the use of the building was considered. Keen local bowlers then decided to form a new charitable company, ‘Scarborough Indoor Bowls Centre Ltd’ specifically to lease the Centre from the Council and manage it themselves. Backed by the Council, the new company spent over £100,000 on the Centre to bring it up to the highest international standards. The project included the installation of a new laser-levelled green, a completely new ceiling incorporating dazzle free lighting and significant modifications to the heating and ventilation system. With the work completed the Bowls Centre was officially re-opened on Saturday 27th September 2003, when two International Champions, Andy Thompson and Amy Monkhouse played demonstration matches against local champions in front of an invited audience. The Deputy Mayor and Mayoress, Councillor and Mrs Herbert Tindall, officially opened the Bowls Centre when they presented keys to the youngest member of the Scarborough Indoor Bowls Club, 10-year old Natalie Devonshire and the oldest member 89 year old Jim Hazell. In April 2013, Scarborough Bowls Centre received £50,000 of National Lottery funding to upgrade the lighting at the Centre, which has helped many local people, both young and old, get into sport since it opened its doors in 1989. 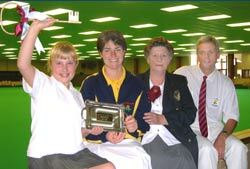 Among those who learned to bowl at the club are Carole McLean, the Centre’s most successful lady bowler who was national Champion and regularly represented England up to the moment of her untimely death in 2011. The Centre’s Junior Section coaching team are hoping that several of the current squad of youngsters will emulate Carole’s International achievements, with Jack Bird (17), John Hall (18), James Brown (15) and Mathew Bell (12) expected to participate at the very highest level of the sport. The improvements to the Centre focused upon a complete new LED panel lighting scheme throughout the building with work being carried out to the bowls area, the spectator viewing gallery, the Club’s function suite, bar and cafe areas and staff rooms and offices. Lighting levels are now much improved, with a cleaner, crisper, more natural light enhancing bowls games for players and spectators alike. 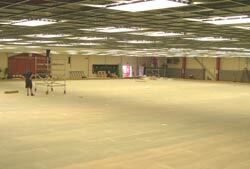 The installation of new technology LED panels will also help reduce the Centre’s energy bills in future years. The LED lighting produces a brighter light using much less electricity than the former fluorescent tubes. Maintenance costs have also been reduced as each unit is designed to last up to 5 times longer than those prevously installed. The Centre intends to invest all savings made on energy bills into extending the coaching courses available to anybody wishing to learn the game. Junior school children, young adults, parents and grandparents are always welcome at the Centre and fully qualified coaches are on hand to arrange free taster sessions and affordable coaching sessions.